It has been a little while since we put out an update. After the Blackhawk Farms race we got very busy. 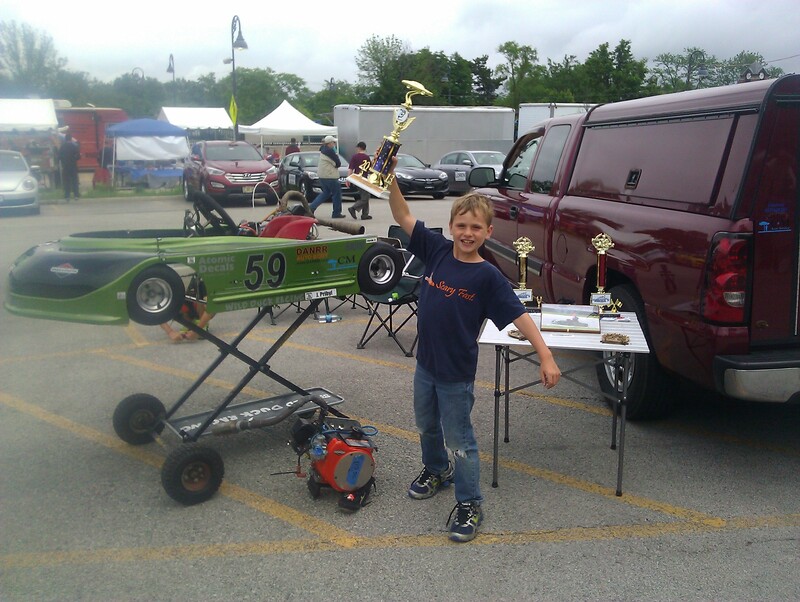 We entered the kart in Glenview Summer Fest car show and managed to win trophy with a slightly dirt racing kart. I am not really sure how they marked us for door sils and trunk interior but the motor was clean. We also hung out at the C&M Auto team after the show. Folks definitely enjoyed seeing the kart and talking about racing and cars. We have been going to car shows to promote karting and have been having lots of positive response. We have also been to Concept Haulers for two races. The first race was a qualifying race and we where not at our best placing 4th all day long, not much a story to tell. The second race, a heat and night race, and went better. He placed 2nd, 1st, and 2nd in the feature. Jason started the second heat in third as the race started Dylan and Chad spun out in turn 1. Jason managed to get through them with out incident and lead the race to the finish. Winning the second heat put Jason on the pole for the feature. On the start Dylan beat him to the first corner and was gone. Chad was not able to get around him and they stayed that way to the end. This was a extra special night because both his Mom and sister where there to cheer him on. Next weekend we are headed to 5th and 6th races with the Championship Enduro Series at Grattan Raceway in Belding, MI. We expect to see a number of Badger folks there is weekend too. From what I have heard it is quite the roller coster of a track with lots of fast corners and rolling hills. We are both looking forward to seeing what its like and how he performs. This Sunday’s race is sponsored by our friends at Stardust Memorials. Please show them your support. Thanks to Stardust Memorials for their support this weekend. The Village of Glenview for the great time we had at summer fest. At my wife on our 12th wedding anniversary.